Brad Weldon lost his home to fire when he was a kid, so when a deadly wildland blaze came roaring toward his ranch house in the pines where he lives with his 89-year-old blind mother, he wasn't going to let disaster strike twice. Weldon and his mother's caregiver, armed only with a garden hose and buckets, successfully fought the flames for 24 hours. At times, they had to lie down in the dirt to "avoid burning up" as 60 mph winds drove flames through the forest. Weldon is among a small group of fire survivors who have defied orders to leave and decided to stick it out in the blackened and smoldering landscape. 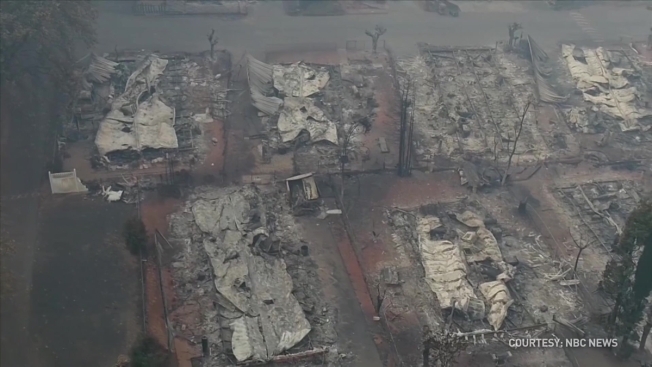 Flames leveled the town of Paradise, which is about 140 miles north of San Francisco, and much of the surrounding area, killing at least 77 people and destroying more than 10,500 homes. Butte County Sheriff Kory Honea said he didn't know how many people were living in the evacuation zones. Deputies who encounter someone in the area will confirm they live there, but won't necessarily take other action. Honea said he was hesitant to spread that message because it might encourage people to ignore evacuation orders, which can create problems even if they survive the initial danger. He said deputies have encountered people who stayed behind and ran out of food. It's an audacious endeavor to stay behind in the smoky ruins with all the challenges that remain: There's no power, no public water supply and there's nowhere nearby to get supplies. Residents who leave to get groceries, drinking water or fuel for generators, aren't allowed to return. The fire continues to burn and the sheriff has said there's no timeline for when people will be allowed back in the area because the scope of the destruction is unprecedented. Knuthson has appointed himself as a guardian in his neck of the woods on the outskirts of Paradise where only two of 22 houses remained standing on his road. He has spray painted a sign saying "Looters will be shot!!" Weldon also feared looters would break into his "hicktorian'' style house — a one-story ranch with ornate Victorian details inside. Knuthson said he knows about 40 people still living in the hills and added that he'd welcome anyone who wants to park a trailer on his large plot of land. When someone offered to bring supplies, 16-year-old Arissa Harvey only wanted textbooks so she wouldn't fall behind. "They had to get out of the smoke," Knuthson said. "To have some kind of life." Some stayed because they had nowhere else to go. Troy Miller, who had tried to evacuate from his Concow home but was turned back by flames, was camping in a truck next to the metal frame that remained of his home. His horse and three dogs survived, but he has no money or insurance to rebuild. Some passing firefighters gave Miller some drinking water, but he was hoping someone would get through the roadblocks and bring him a flashlight and some tarps for rain in the forecast. "I'm alive and I'm still up here. There are plenty of other people worse off than I am," he said. "I've got a lot of faith in God. I think things will be OK."
Weldon said he was also staying put because he didn't think there was anywhere safe he could take his ailing mother — especially now that norovirus has broken out in some shelters. He's confident they can keep going for months with an ample pantry, gas he's siphoning from work vehicles to power his generator and a 3,000 gallon swimming pool he's carefully rationing for bathing and water for the toilet.